This little balcony at Laurel Creek Manor in Sumner, Washington is like nothing I've ever seen before. It's the perfect size for two people to fit into, and the extreme upward angle needed to photograph it practically requires them to be kissing or otherwise not looking down into the camera. 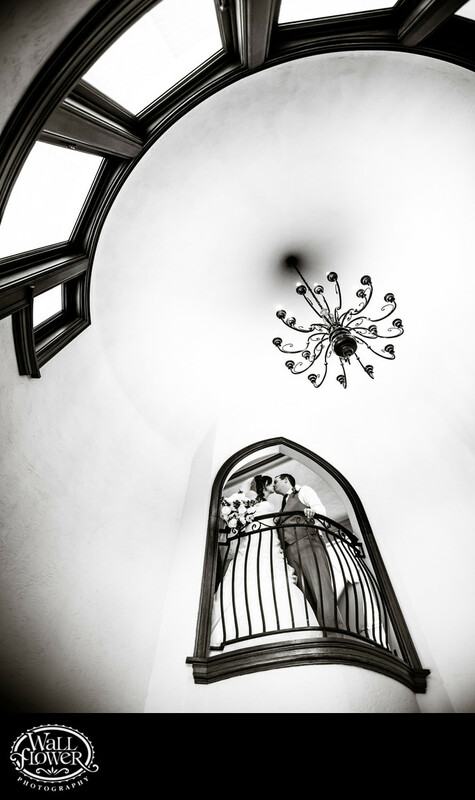 I started with a few tighter shots of the couple in the balcony, then switched to a wider angle that also captured first the chandelier and then the windows on the opposite wall. There were some funky colors on the white walls from the blending of cool window light and warm chandelier light, and I preferred the look of the photo in black and white instead.